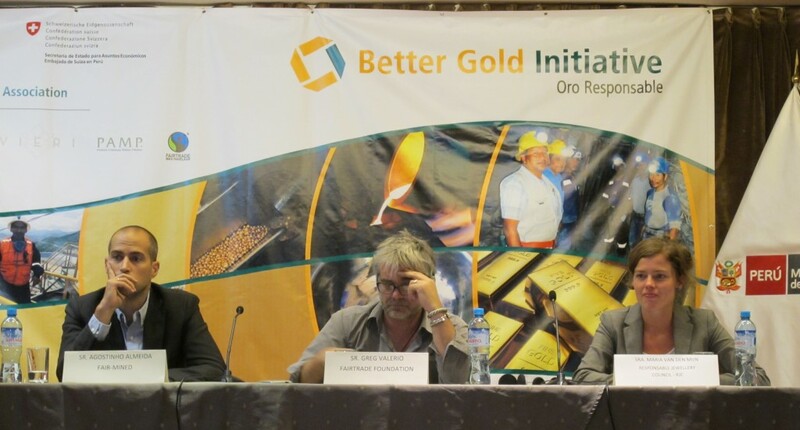 The Responsible Jewellery Council, represented by Marieke van der Mijn, Standards Coordinator, was present at the Better Gold Initiative Conference entitled “Iniciativa Oro Responsable – Mercados Internacionales para una Mineria Aurifera Responsable de pequena escala”. 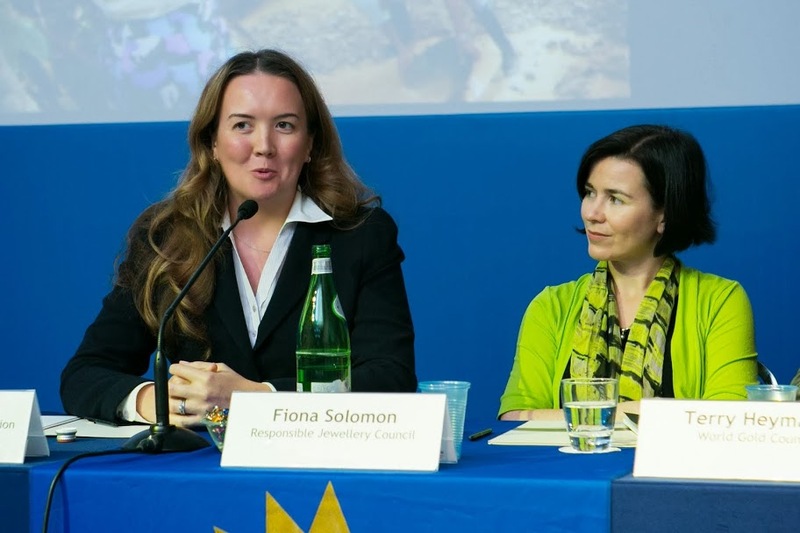 The Responsible Jewellery Council, represented by Board Director Vania Grandi, Rio Tinto, has participated in the 8th Annual Sustainable Supply Chain Summit in London, on 8 October, on the “Keynote session on sustainable supply chain strategy – Can a B2B membership group drive supply chain innovation?” session. The summit addressed key issues in 2013 – Successful internal and external engagement with buyers, middle management and top level decision makers; how to go beyond Tier 1 suppliers; introduce on-site factory training; reduce cost through applying resource efficiency programs in your supply chain and more. This year’s summit featured insight from some top level corporates, including the Group Commercial Director of Sainsbury’s, board level VPs of Procurement and Sourcing from Coca Cola Enterprises and Unilever, Chairman of GeSI and Group Climate Change and Sustainability Officer of Deutsche Telekom and Head of Logistics Europe of Mitsubishi Electric. To have a full run down of the conference, please visit the 8th annual Sustainable Supply Chain Summit. 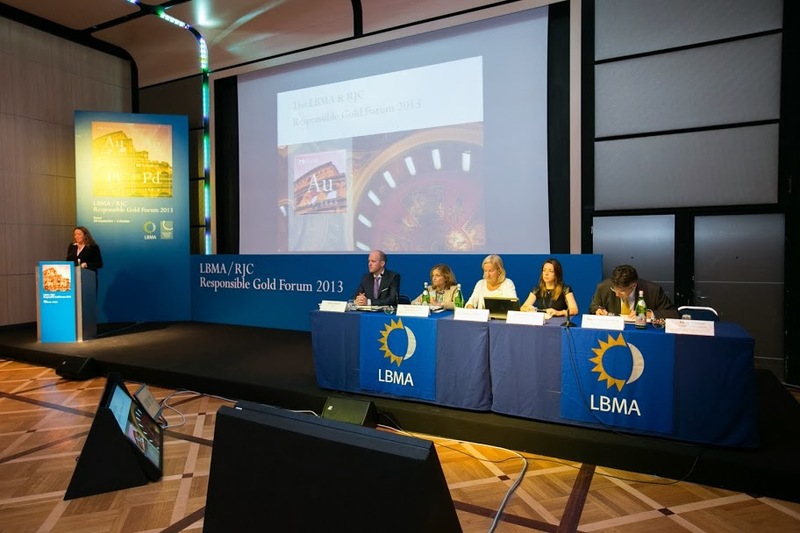 The Responsible Jewellery Council (RJC) and the London Bullion Market Association (LBMA) hosted a Responsible Gold Forum in Rome, Italy on 1st October. 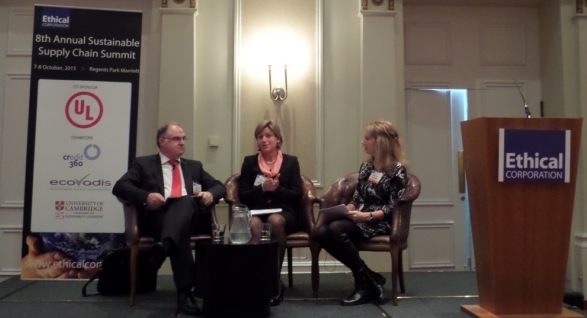 The Forum was held during a parallel session at the LBMA/LPPM Precious Metals Conference. 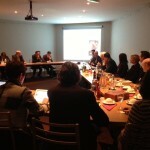 The Responsible Jewellery Council invited industry leaders to a luncheon briefing featuring two representatives of two of its global member companies, Mr. David Bouffard,VP, Corporate Affairs, Signet Jewelers Limited and Mr. Charles Chaussepied, Piaget Director of Corporate Affairs and Richemont CSR Committee member. 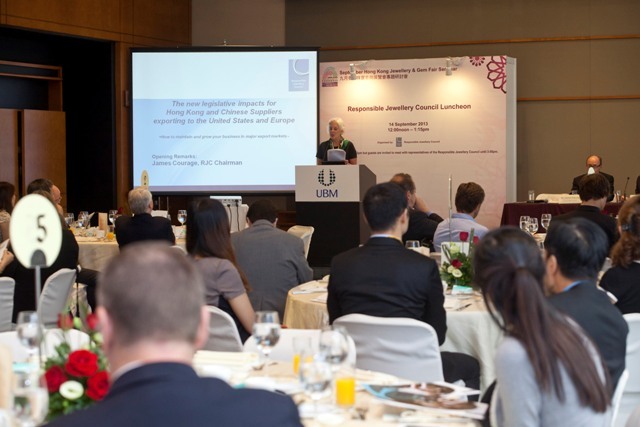 The session was focused on how Hong Kong and Chinese exporters can maintain and grow their business in the United States and European markets while working with the impacts of conflict minerals legislation. 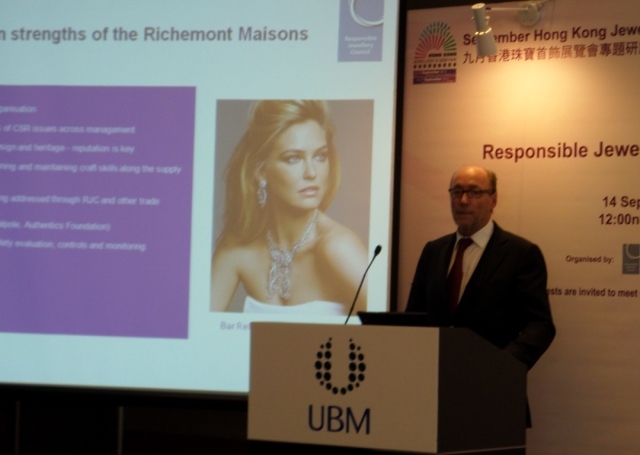 Guests heard an overview from industry leaders of the top luxury and sustainability issues facing the fine jewellery and watch supply chain. For a copy of the slides in Chinese please click here. 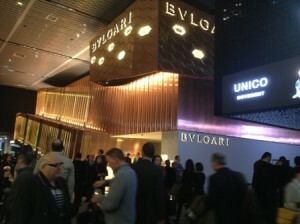 The RJC was located at booth K102 during the show. 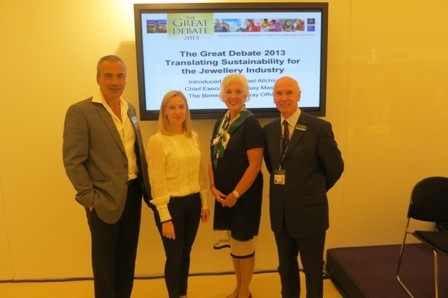 A panel discussion with industry experts was held on Tuesday 3 September at 15.30 in the Whitehall Room. 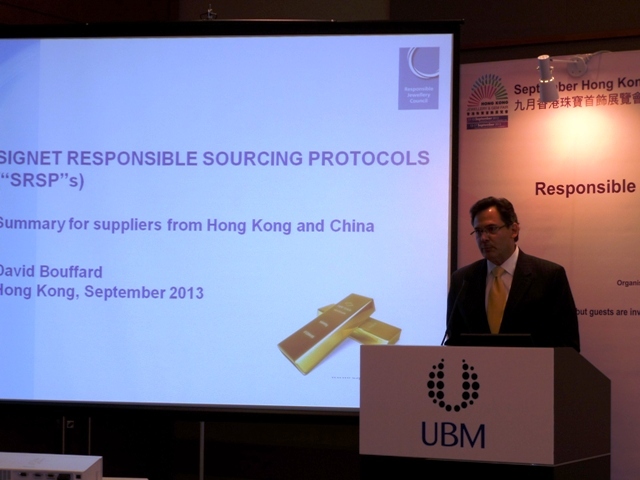 The topic was “Responsible gold sourcing – Latest Developments on Industry efforts for gold supply chain due diligence and chain-of-custody”. 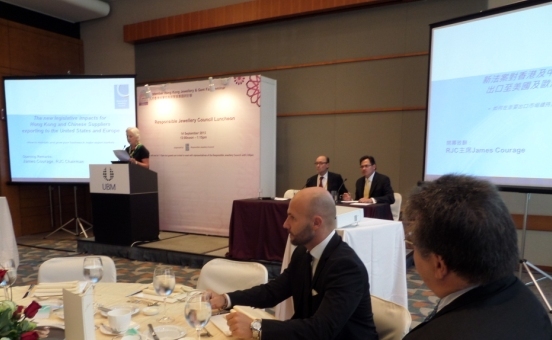 CIBJO, the World Jewellery Confederation and RJC signed a Memorandum of Understanding (MOU) on 1 September 2013, at IJL. The MOU reflects the willingness of both organisations to collaborate on efforts to entrench a solid understanding and commitment from the jewellery industry, to improve its performance in the crucial areas of human rights, social and environmental performance and ethical business practices. The MOU will work to further advance responsible business practices among all sectors of the jewellery supply chain, and will include the use of CSR education programmes developed by CIBJO, in collaboration with the United Nations, and chain of custody certification programmes, developed by RJC. The event, organised by The Birmingham Assay Office, looked outside the jewellery industry to learn how the fashion and grocery industries have faced up to the challenges of delivering an ethical and sustainable supply chain. During the debate, Catherine Sproule announced the Memorandum of Understanding between RJC and CIBJO and presented the highlights of this cooperation. Michael Allchin, Chief Executive of The Birmingham Assay Office, invited the audience to draw parallels with the jewellery industry and consider what more needs to be done. 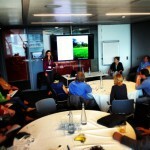 RJC participated in a session on ‘Real Recognition’ at the ISEAL Annual Conference in London. Marieke van der Mijn, RJC Standards Co-ordinator, gave an overview of RJC’s cross-recognition agreement for gold refiner audits with the London Bullion Market Association (LBMA) and the electronics sector’s Conflict-Free Sourcing Initiative, and RJC’s recognition as a ‘Recognised Responsible Mining Standard’ of the Fairtrade-Fairmined producer standard for artisanal and small-scale gold miners. This session featured a panel of experts from mine to retail that shared their progress and experiences on initiatives to address gold sourcing in the jewellery supply chain. The session covered: Why responsible sourcing and supply chain due diligence has become important and the role of gold refiners; The LBMA Responsible Gold Guidance; The RJC Chain-of-Custody Standard; Connections between industry initiatives and Implementation experiences. Damiano Zito, CEO, Progold S.p.A.
Jacqueline Mayor-Meylan, Compliance Officer, P.A.M.P. Solidaridad and the Responsible Jewellery Council held a joint presentation at PDAC “The Growing Market Demand for Responsibly- Produced, Conflict-Free Metals: What Mining Companies Need to Know”. This session, led by representatives of responsible sourcing initiatives, industry members, governments and civil society organizations, featured a discussion about the laws, voluntary standards and pilot projects that are influencing metals buyers, and how the changes can impact mining companies, regardless of where they operate. The RJC is reviewing its Code of Practices, the certification standard applicable to all RJC Members in the jewellery supply chain from mine to retail. 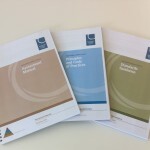 Consultation workshops were held to discuss the proposed revisions and provide feedback. These workshops took place in Mumbai & Surat in February 2013. Marieke van der Mijn, RJC Standards Coordinator, participated in this Chatham House event which is being held as part of the De Beers Diamond Dialogue Series. The RJC is reviewing its Code of Practices, the certification standard applicable to all RJC Members in the jewellery supply chain from mine to retail. Consultation workshops were carried out in London, Geneva, Antwerp, New York, Mumbai and Surat to discuss the proposed revisions and to gain. 22 January 2013 – 10.30-11.00am – RJC Industry Briefing – Responsibility and Assurance in the Jewellery and Watch Industry The Responsible Jewellery Council (RJC) and The Fondation de la Haute Horlogerie (FHH) are delighted to invite professional buyers and specialist press to a briefing on the growing movement of consumer awareness in responsible business practices for luxury products. Leading Suppliers from the fine jewellery and watch industry will convene to discuss responsible business practices and the importance of the RJC Certification system. Dr Fiona Solomon, RJC Standards Director, presented at the Jewellery Technology Forum on the 20th January on Due Diligence in the Gold Supply Chain.